Apple's recent removal of several podcasts produced by Infowars, the media company run by conspiracy theorist Alex Jones, was the result of a decision made by CEO Tim Cook and senior vice president of Internet Software and Services Eddy Cue in a weekend meeting. According to a report by CNN journalist Dylan Byers, published in his newsletter Pacific, Cook and Cue met over the weekend to discuss what to do about the pressure to remove the Infowars content. That meeting, "sources familiar with the matter" told Byers, resulted in Apple dropping five of Infowars' podcasts from iTunes and Apple Podcasts. 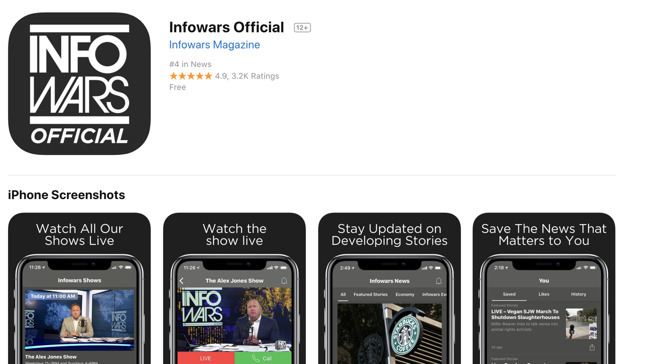 The executives decided to keep the Infowars app available in the App Store, as they determined it had not violated any of Apple's terms of service by itself. The app allows users to view all of Jones' live video content, so the actual impact that Apple's removal of the content will have remains to be seen. The removal of the five podcasts took place Sunday night, and was first reported by Buzzfeed News. The Jones issue is a flashpoint in a continuing controversy over how large tech platforms should weigh the value of freedom of expression against the scourges of user harassment and propagation of false information. In removing Jones, Apple takes away a platform from a chronic violator of Apple's content guidelines, while at the same risking alienating Jones' audience and turning the host into a martyr. Apple has been clear that it takes its guidelines seriously, with Eddy Cue stating at South by Southwest last spring that "we do think free speech is important, but we don't think white supremacist speech or hate speech is free speech that ought to be out there." Those comments were delivered in an onstage interview with Byers, the author of Tuesday's report. Alex Jones is known as a controversial political commentator who has espoused conspiracy theories, often in relation to mass shootings and other tragic events. Jones has been sued by several families of victims in the 2012 Sandy Hook massacre, who claim they have been harassed as a result of Jones claiming that the shooting was a hoax. While Facebook and Google's YouTube followed suit and removed Jones' content on Monday, there was no coordination among the companies in choosing to do so, according to Byers' reporting. Jones has not been banned from Twitter, and his website, Infowars.com, remains online and continues to host content. It currently features the headline "The War to Destroy Alex Jones, Part 1."